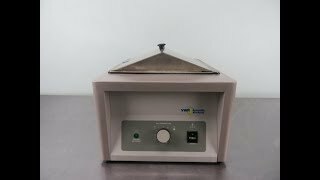 The VWR 1203 is a reliable analog water bath used for multiple lab applications and is constructed out of high grade materials resistant to most chemicals and built to withstand the rugged day to day operations. The temperature range of the VWR 1203 Water Bath is ambient to 99.9°C and comes with a temperature sensor seated below the heated mat to regulate the temperature. This waterbath comes with thermal beads to be used in place of water, holding vessels upright no matter the shape, and you never need to worry about accidentally running the system dry. This easy to use water bath also comes with a built-in power cord and runs off of 115 voltage and a stainless steel gabled lid that channels condensation away from potentially dripping back onto samples. This VWR 1203 water bath has been fully tested by our team and is ready to ship. All of our lab equipment comes backed with our standard warranty. Should you have any used lab instruments for sale please don't hesitate to contact us.